We’ve long been curious about the rash of “hero pit bull” puff piece stories that seem to sprout like mushrooms immediately after each new horrific pit bull attack. 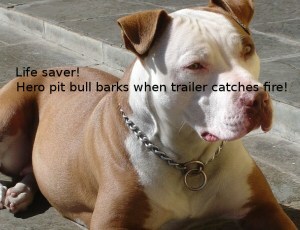 Curious because they almost invariably seem suspect; there is little if any evidence, only a story from a somewhat less than impartial pit bull promoter. ← Kim Stojakovic has no soul, what kind of a monstrous mother is she?